Manufacturer of a wide range of products which include air dunnage bags and dunnage bags. Our reputation in the market is largely attributable to our popular collection of Air Dunnage Bags. The offered bag is fabricated with the help of basic material and modular technology, under the supervision of skilled professionals. Apart from this, remarkable quality and exceptional resistance to tearing and moisture increase demand of our offered bag in the market. We offer this bag in various specifications and deliver them within a set time - frame. Can withstand up to 90% relative humidity (RH) at 60 deg C.
Have a very high wet strength due to the complete unique choice of materials and composition. 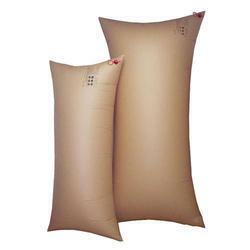 We are prominent manufacturer supplier and exporter of Dunnage Bags. Our exclusive range of HM is available in roll form or pouch forms used for packing materials like milk, mineral water, edible oil, soil, detergent powder and others. Our Dunnage Bags are printed in mono layer and multi layer.